Most people have had some experience making repairs to concrete. Repair enough concrete and you’re bound to have a project that didn’t result in an acceptable outcome. What are some of the elements that can help assure your repair is successful? Repair mortars are not skim coats! Do not attempt to use repair mortars as thin resurfacers. Always use a structural repair mortar for load bearing applications. Use a repair mortar whose properties match the intended repair depth. Use a repair mortar whose performance characteristics closely match the surrounding concrete. Stronger is not better if it results in dissimilarities between the repair mortar and concrete when subjected to temperature changes, flexural stresses, impact, etc. Plan the logistics of your repair around the needs and limitations of the product that will do the job as needed. Do not attempt to modify the use of a product to suit your logistical needs. You’re more likely to be satisfied with the outcome of a repair if you understand its limitations at the outset. Have realistic expectations about how a functional concrete repair may look. No repair mortar can be installed to a feather edge and then subjected to demanding environments that include wheeled traffic, shovels or plows, thermal expansion and contraction, freeze/thaw damage, etc. Most repairs are highly visible. Subsequent use of an opaque pigmented sealer can help hide repairs. Proper surface preparation is essential to long lasting repairs. Remove any loose or unsoundly bonded concrete. Remove any grease, oil, dirt or dust that may impede adhesion. Define the perimeter with saw cut or chisel. Clean any exposed rebar to NACE 3, SSPC SP6 standards. Then coat with ChemMasters Duraguard 100 epoxy primer. Consider use of a bonding agent. Saturate the repair area with clean, potable water. Leave ponded for up to 24 hours, removing any puddles or standing water immediately prior to installation leaving an SSD condition (saturated, surface dry). This will prevent water loss from the mortar, preventing a desicated bond line. Successful concrete repairs require careful observance of product installation instructions. Read and understand Product Data Sheet instructions. Remove the load from structural components prior to making a structural repair, and for the duration of mortar cure. Mix repair mortar according to Product Data Sheet instructions. Do not over water. Apply a “scrub coat” prior to mortar installation, ensuring maximum mortar contact in all recessed areas. Do not apply a watered down “slurry coat” with an elevated water to cement ratio, creating a weakened bond line. Follow ACI 305 “Moist Cure Procedure for Hot Weather Concreting Standards” for installations over 85° F (29.4° C). Follow ACI 306 “Cold Weather Concreting Standards” for installations below 50° F (10° C). Finish to desired surface texture. Apply a curing compound if instructed to do so. 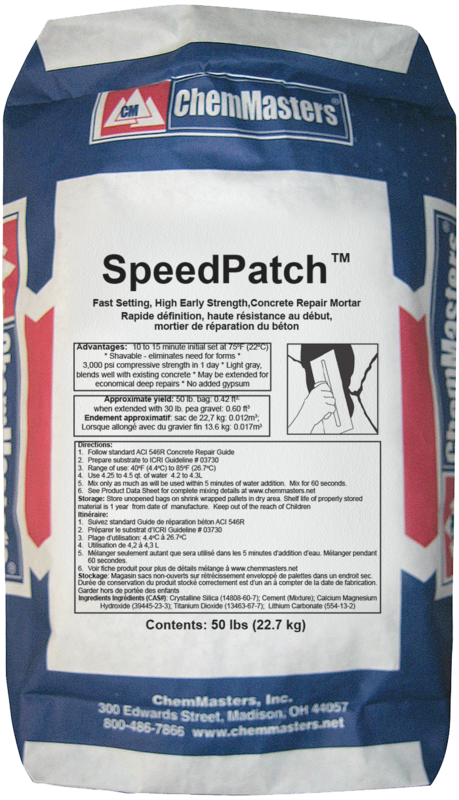 ChemSpeed 65 is a high strength, very rapid setting, structural concrete repair mortar. It is a portland cement based material and requires only water for mixing. 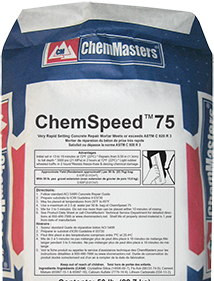 ChemSpeed 75 is a one component, high performance structural repair mortar. It produces high early strengths at a wide range of temperatures. 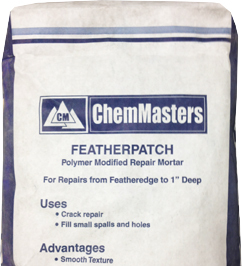 ChemPatch VO1 represents a breakthrough in concrete repair technology. It is a one component, polymer modified, fast setting, non-shrink structural repair mortar. DuraPatch EPX is a specially formulated, three-component, l00% solids epoxy systems for resurfacing and repair of concrete substrates. DuraPatch EPX contains a quartz aggregate blend for heavy duty, industrial floors. 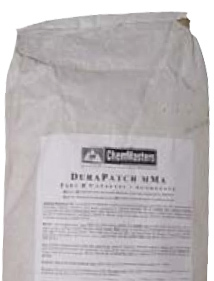 Durapatch mMa is a two component, methyl methacrylate based concrete patching material. Durapatch mMa sets very rapidly to minimize downtime or traffic disruption. 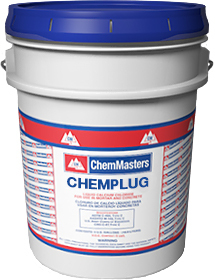 ChemPlug is a fast-setting, expansive hydraulic cement and is compounded to withstand continual exposure to water, even under pressure. It is cement based, fills and seals the pores and voids of the concrete or masonry surface.